"Having used Dunlop green tortex picks for over 4 years I saw little need to change. However after trying the cactus picks medium weight plectrum I've had little choice but to change my habits. An immediately comfortable shape with a clever grip pattern that isn't intrusive makes for a super playing experience. Sweaty fingers won't spoil anymore performances and the crowd have no risk of a stray pick in the eye. I'm sold. (I like the colours too!" "I spent a long time getting annoyed at picks, either shedding on my strings, or breaking my strings. I thought I had found my pick, Dunlop Tortex Red's and was vaguely satisfied. Then along came Cactus Picks and changed everything. I ordered a mix of lights and mediums, and both are perfect. Just enough attack, just enough flexibility, amazing grip and great designs. Thank you Cactus Picks for being the best I have ever used and for being incredible value for money!" "The three things every single musician looks for in a pick are; A non-slip gripping material, a variety of size and shape so you change around your picks to achieve different sounds, and (let's be honest) you want your picks to look good too. Cactus picks achieve all these things in their amazingly designed guitar plectrums. The outstanding comfortable shape and grip they have makes playing live ten times easier and stops you from having those exceptionally embarrassing moments when you drop your pick on stage and franticly look around for another one! 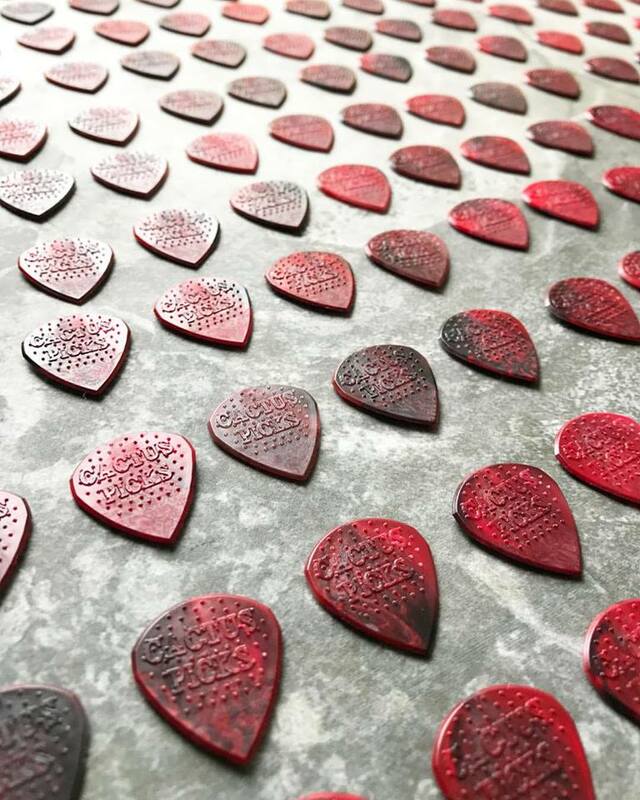 Congratulations Cactus picks for making one of the most comfortable, cost affective, and best looking picks around!" "First, a little background…I've been playing guitar for over 30 years, and to say I'm picky about my gear would be an understatement.So, for me to switch which picks I'm using, is no small thing.Many years ago, after countless hours of experimentation with innumerable picks, I finally settled on Dunlop delrin 1.14mm picks as my "pick of choice. "I still have about 100 or so laying around... This all changed when I first checked out Cactus picks…The grip alone changed my perception of what I could do with a pick.And that was just the start…More control led to more tonal options, which led to new ideas, and on and on…So, I just wanted to say thanks, Cactus picks, for my new "pick of choice"..And, don't worry, I've been telling my friends!